Are Your Eggs Really Fresh? 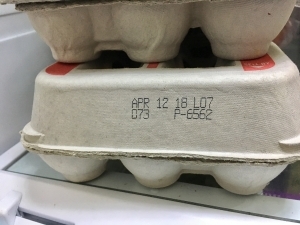 I always thought the expiration Date meant the freshest eggs…until now! Even though the expiration date may be the same, some eggs may be fresher than others. It’s called the ‘Julian Date’ or the date they were packed at the plant. It’s a 3 digit number that corresponds to the day of the year, with January 1st being day one and December 31st being day 365. So in the picture above, the expiration date is April 12th, but the Julian Date is March 14th. So when you want the freshest eggs, always check for the Highest Julian Date.